Take time to see the wonders of the world, to see the things you’ve only ever heard of. Dream life the way you think it ought to be, see things you thought you’d never ever see. IN PREPARATION FOR THE NEXT TEN DAYS OF ACTIVITIES we took today as a day of adjustment and rest. Some of us took an extended nap, several of us walked around the facilities and met several of the local workers in Kachele Farm. Its namesake is after a huge tree on the grounds named Kachele tree. Wanting to ﬁnd out the right path, we asked a worker called Matthew—who was raking fallen leaves from mango trees—for direction. Instead of only pointing to us, he offered to put Myra and I on a truck and gave us a quick ride directly to the Kachele tree. The tree is huge and it has a wide canopy. Noticing there are multiple deep slashes across the trunks—from the exposed roots above ground reaching upward almost to the top branches—we asked Matthew why. 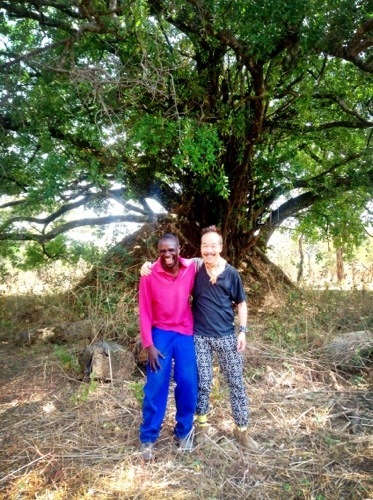 He told us that years ago, the inhabitants around the area would come to this tree and hack the trunk diagonally with a machete multiple times, then they would place metallic wires right below the wounds, and connect the wounds together by winding the wire around the trunk downward. At the terminus was placed baskets to collect the tree’s oozing sap. Matthew went on and said the villagers would use the sap as rubber or a glue substance so potent it can stick a strong man on the spot which nothing can peel him off. Matthew related this background story to us in sincerely and amusement, combined with his contagious laughter, he made Myra and I laughing the whole time. On the way back, we asked him about his family background. Maintaining his cheerful attitude he related to us that he’s also an orphan before he turned nine years-old. Without any close relatives he traveled town-to-town with a friend his age, ﬁnally made it to Kachele Farm and found a new family. Matthew and I sticking in front of the Kachele tree. Many of us are like the Kachele tree, wounded in many ways. Yet by the grace of God we are still standing tall, providing shades for others, and our sap is stronger than Krazy Glue. Click on content image to view larger version. Hello Roger, thank you for the posts and pictures. God is probably keeping you very busy now. God bless you and the team. I’m reading some of your blogs. It’s great that God uses your creativity to reach across the world with God’s Love. Wow, what a huge tree! Looks like you made a friend! Enjoy reading your posts and hearing your Africa adventure!